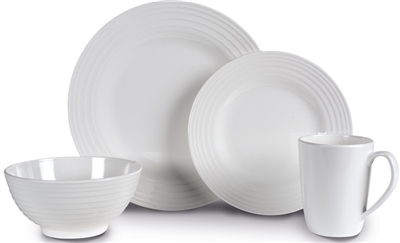 The Blanco set, from the Contemporary collection of melamine tableware, combines clean, neutral colour pallet with a sophisticated concentric ridge design. This 16-piece set, made of 100% melamine, is extremely durable, lightweight and dishwasher safe. This 100% melanine set has 16 pieces so is ideal for a family of four. The items are also available individually so that the set can be expanded to suit more people. Mugs only available as a set of 4. All items dishwasher safe on top rack only. This looks so close to the real thing. Good quality and so far rather sturdy. Very happy.